The front side of the Gliding Computer is made of a milled aluminium frame. This should make a high-grade look and a perfect fitting to the instrument panel. Especially the outline dimensions should be as small as possible, because there is only little room for many instruments. For an easy acquisition of the material, the frame has only a thickness of 20mm. This would help to minimize the costs of a later batch production. The rear side of the frame is constructed dissymmetric, because the LCD is also not symmetric to the center point of the active area. The reason for this is, that the LED backlight is placed on two borders of the display and they need extra room. So it would be possible to safe some more installation space, but then the front side wouldn´t be symmetric and you couldn´t assemble the gliding computer in any direction to the instrument panel. The next step will be optimizing the CAD drawing for production. 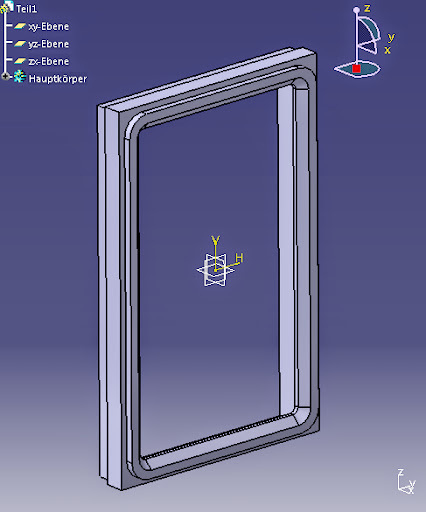 There are still missing some bore holes, radii and tolerances.